Litepanels®, A Vitec Group brand, announces the premier of the Croma™ LED light at September’s IBC equipment exhibition in Amsterdam. Ideal for use on-camera or off, the new sleekly designed fixture provides Litepanels’ hallmark HD-friendly soft light, with variable color temperature output from daylight (5600°K) to tungsten (3200°K). The Croma draws just 9W, and provides the equivalent luminance output of 40W – 90W traditional fixtures. To power the fixture, the user has the choice of AA batteries, optional AC adapter or a DV Adapter Plate designed to mount Sony, Canon, Panasonic DV battery packs. Six 1.5V AA batteries install within Croma to provide power from 1.5 to 6 hours, depending on battery type. The compact Croma weighs just 12 oz. (.4 kg) and measures 6” x 4” x 2” (54mm H x 36mm W x 102mm D). To facilitate positioning when mounted on the camera, Croma comes complete with a metal ball head shoe mount featuring a 1/4 x 20 thread. Also supplied with the light is a carrying case and diffusion gel filter kit. An optional baseplate is available for off camera use. Litepanels, pioneering developer of proprietary LED lighting and a Vitec Group brand, will show a wide range of its HD-friendly daylight balanced LED lighting fixtures, including the new H2 Hi-Output™ LED fixture. NAB will mark the world-wide debut on Litepanels’ H2 Hi-Output LED lights. The new fixtures answer the need for an LED fixture capable of throwing illumination over a 20 to 25 foot (6.1 – 7.6 M) distance, providing HD-friendly light with all the advantages of Litepanels LEDs. The new H2 Hi-Output is 5600°K color balance, utilizing an array of 72 one-Watt daylight LEDs that are focused to a 10° angle. Litepanels’ Sola Fresnel LED Fixtures are now shipping. The revolutionary daylight-balanced Sola Fresnels provide the controllability and single-shadow properties inherent in a Fresnel light, but utilize just a fraction of the power of conventional fixtures. 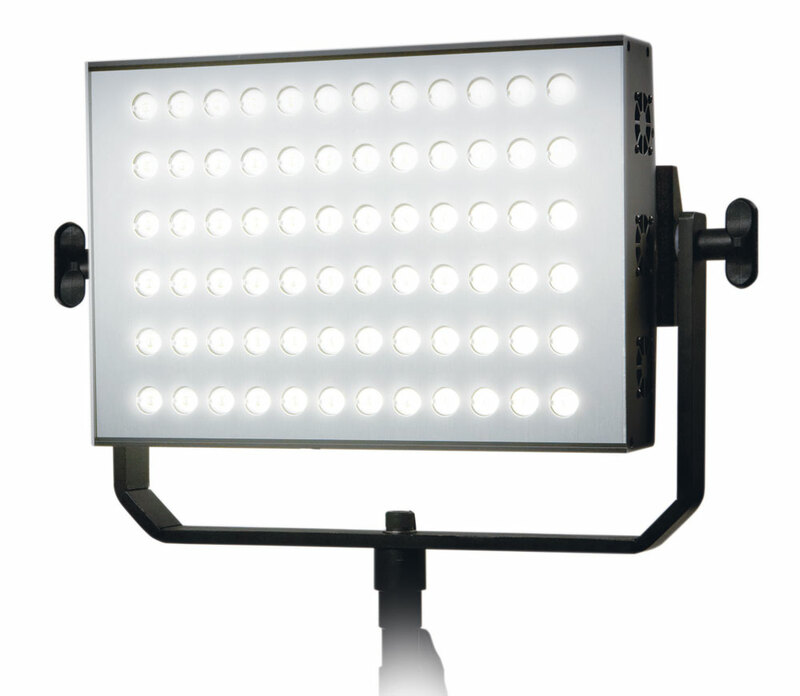 The Sola 6™ is a 100W studio or remote fixture; the Sola ENG™ is an on-camera 30W fixture. Litepanels extensive line of 1�1™ arrays of LED bulbs will be showcased at NAB. 1x1s have become the industry standard for studio and location lighting. Various models provide daylight or tungsten, or can dial up a color balance in-between. Light angles of flood, 30° and 15°, and focusable models are available. And the Low Profile takes up just 3 inches of headroom. 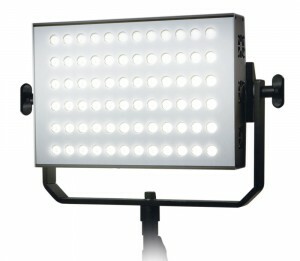 The lineup of on-camera LED light fixtures from Litepanels will also be demonstrated. These small, portable, battery powered LED lights are designed to meet the needs of ENG and field production, providing HD friendly soft fill light. Micro and MicroPro daylight fixtures run off of standard AA batteries, and provide as much as six hours of run time depending on the type of batteries used. The MicroPro Hybrid provides the company’s hallmark soft continuous lighting plus adds a 400% burst flash feature for still photography. MiniPlus fixtures are available in daylight balance flood and spot & tungsten balance flood models. 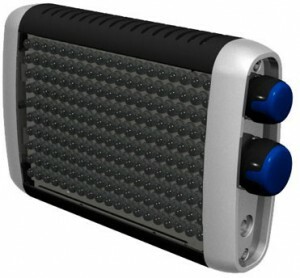 Plus, the company’s famous beauty light, the LED Ringlite will also be on display. Litepanels much anticipated Sola ENG LED Fresnel model, which has already garnered major industry awards, is now shipping. Offering beam control of 10° to 70°, the revolutionary new daylight-balanced Solas provide the controllability and single-shadow properties inherent in a Fresnel light, but utilize just a fraction of the power of conventional fixtures. Employing a proprietary 7.62cm (3”) lens, it draws just 30 watts yet produces light output equivalent to a 250W tungsten. Like all Litepanels, Sola ENG Fresnels feature instant dimming from 100% to 0 with no noticeable color shift. 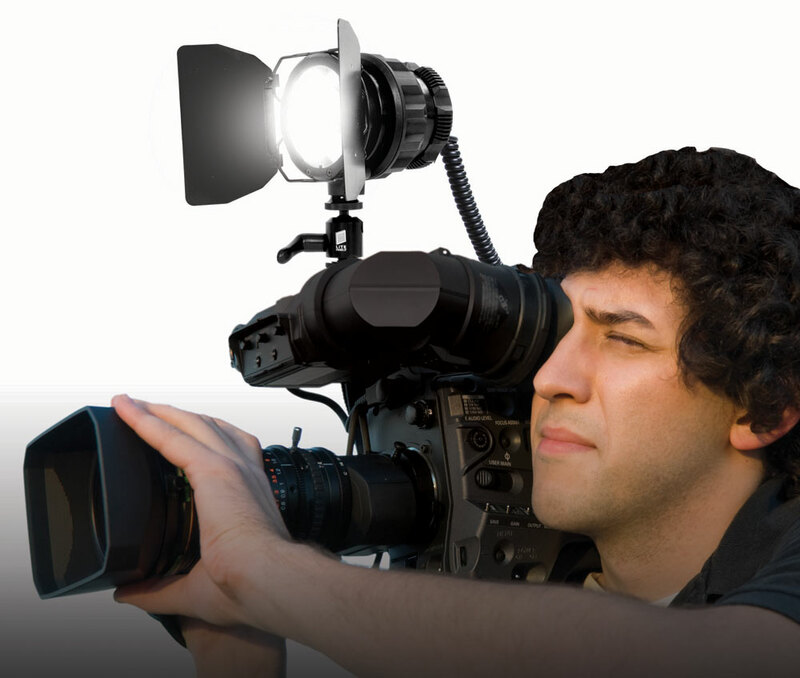 The SolaENG provides manual focus and dimming control via camera lens style ergonomic controls. Output is fully flicker free, and remains consistent even as the battery voltage goes down. Employing Litepanels’ ultra-efficient LEDs, Solas draw 90% less power than conventional tungsten lights, with very little heat generation. Designed for both on-camera and off-camera mounting, the SolaENG is only 102mm x 102mm x 127mm (4” x 4” x 5”) and weighs just .28kg (10 ounces). The SolaENG runs on 10-20VDC sources such as camera batteries.